Valid for 10 years, Extendable further 5 years. A Design refers to the features of shape, configuration,pattern, ornamentation or composition of lines or colours applied to any article, whether in two or three dimensional (or both) forms. This may be applied by any industrial process or means (manual, mechanical or chemical) separately or by a combined process, which in the finished article appeals to and judged solely by the eye. Design does not include any mode or principle of construction or anything which is a mere mechanical device. It also does not include any trade mark or any artistic work. Design registration provides the creator, exclusive rights over use of the design for a period of ten years, that can be further extended for a period of five years. In case of infringement, the owner of a registered design can seek legal remedy under the Design Act. Benefits of Industrial Design Registration? By Registering the Design with Authority, applicant Obtain exclusive rights to a product with a particular appearance which may result in a substantial return on the investment because it will allow you to prevent others from reproducing a popular design. An industrial design registration may be a valuable business asset. The success of a product is usually influenced by its appearance; in an aesthetic-driven consumer base, the looks of a product also plays an important part to attract consumers towards the product to buy. If your industrial design is infringed upon, you may bring your case to court and be awarded damages for the lost sales you have incurred as a result of the infringement of your design registration. This allows you to focus on establishing products on the basis of superior industrial design without worrying about knock-offs from competitors who can produce items cheaper or who can scale their manufacturing quicker. Owner can license or sell his design as legal property for a consideration or royalty. 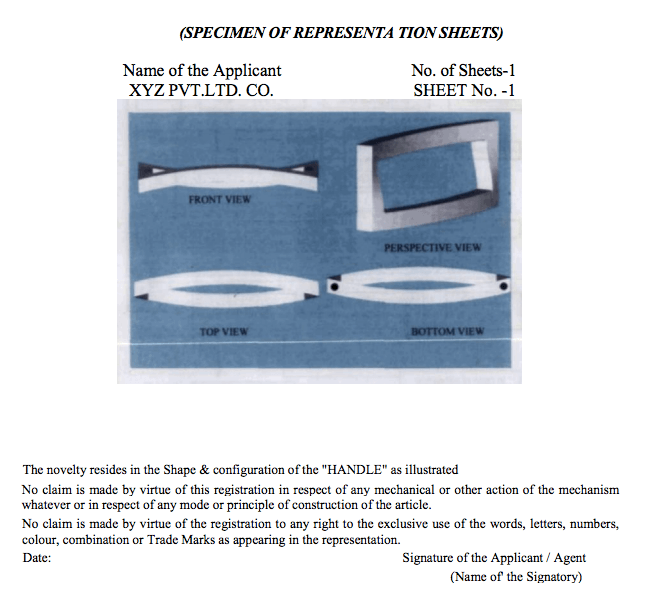 Documents Requirements for Industrial Design Registration? Class 2:- Articles of clothing and haberdashery. Class 3:- Travel goods. cases. parasols and personal belongings, not elsewhere specified. Class 5:- Textile p1ece goods, artificial and natural sheet material. Class 7:- Household goods, not elsewhere specified. Class 8:- Tools & hardware. Class 9:- Packages and containers for the transport or handling of goods. Class 10:- Clocks and watches and other measuring instruments, checking and signalling instruments. Class 11:- Articles of adornment. Class 12:- Means of transport or hoisting. Class 13:- Equipment for production, distribution or transformation of electricity. Class 14:- Recording, communication or information retrieval equipment. Class 15:- Machines, not elsewhere specified. Class 16:- Photographic cinematographic and optical apparatus. Class 18:- Printing and office machinery. Class 19:- Stationery and office equipment, artists' and teaching materials. Class 20:- Sales and advertising equipment. Class 21:- Games, toys, tents and sports goods. Class 22:- Arms, pyrotechnic articles, articles for hunting, fishing and pest killing. Class 23:- Fluid distribution equipment, sanitary, heating, ventilation and air-conditioning equipment, solid fuel. Class 24:- Medical and laboratory equipment. Class 25:- Building units and construction elements. Class 27:- Tobacco and smokers' suppliers. Class 28:- Pharmaceutical and cosmetic products, toilet and apparatus. Class 29:- Devices and equipment against fire hazards for accident prevention and for rescue. Class 30:- Articles for the care and handling of animals. application for restoration of lapsed design under section 12(2). Consultant shall appear before authority to represent your case. This is first step to start processing your design registration. Need to hire a Professional for this purpose to avoid any mistake in application process. Here need to disclose the Design to professional. A Design Search or Inspection generally conducted by Applicant to find out whether any similar registration already exists. Application for Inspection is filed with Registrar by paying Govt. Fees. THIS IS OPTIONAL FOR APPLICANT. Hire a Professional for this service is recommended. Registration process starts here. 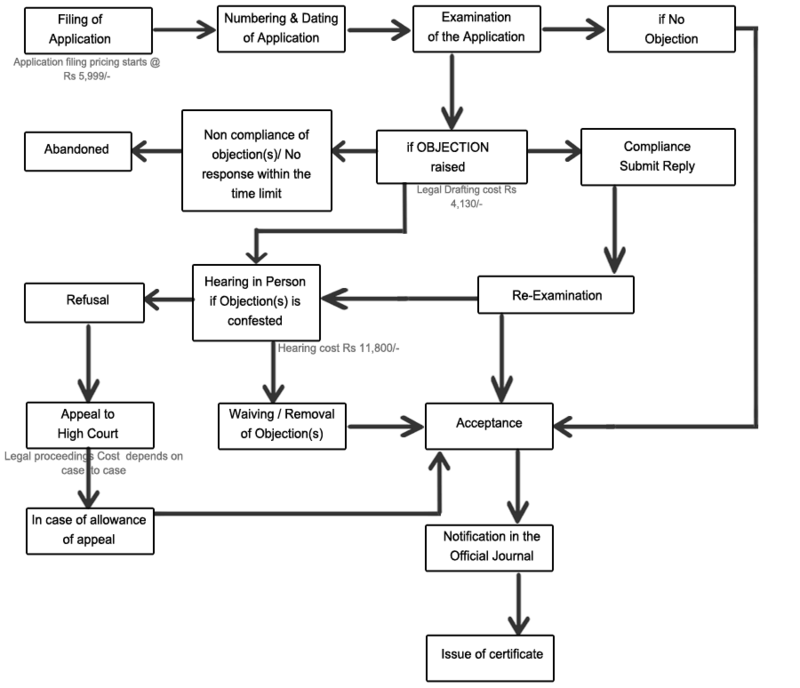 Drafting of Application in prescribed form is a specialised job. With the help of Consultant get prepared application, Representation of Design, Statement Novelty and Disclaimer and Power of attorney. Once your application drafting is completed and checked properly, next step is to file the design application in prescribed manner. That is in the appropriate forms along with Govt. fees. Govt. Fees varies based of type of applicant. If there are no objections, the design will be registered. then the applicant is required to comply within 6 months from the date of filing of the application. Abandonment :- If the applicant fails to respond to the objections or does not comply with the objections raised within the time limit, then the design shall be deemed to have been abandoned. Hearing: - In case the applicant contests the objections, and the Controller is not yet satisfied, then a Personal Hearing is called within 1-2 months, based on that result is determined. The applicant can appeal to the High Court if not satisfied by the outcome of the hearing. Once the applicant fulfills all the formalities and requirements, design is published in the Official Journal, which is published every Friday. The design is then entered in the Register and a certificate of registration is issued to the applicant. With Objection, Entire Process Typically takes 8-12 months. Without Objection, normally takes 3-6 months. Our Package Inclusion in Industrial Design Registration Service? Our Professional give on call consultation to client first to make him clear about the process of registration with Authority and documents requirement and pricing. Our professional first searches the similar design registration if already exist. This is also termed as Novelty Search and this search would cost extra for applicant towards Govt. Fees and professional Fees. But it saves Time, Application Filing fees and all Legal Proceedings expenses, which applicant incurred if apply for his Design similar to Other and lateron rejected by controller. Professional prepare your application and co-ordinate with you for all relevant documents, representation of design, Statement of novelty and disclaimer, etc. Once your application drafting is completed and checked properly, Our Professional file your application along with payment of Govt. fees. Once authority accepts the Application and all formalities completed by authority and applicant, Registration Certificate Issued. books, calendars, certificates, forms-and other documents, dressmaking patterns, greeting cards, leaflets, maps and plan cards, postcards, stamps, medals. any principle or mode of construction of an article. parts of articles not manufactured and sold separately. variations commonly used in the trade. mere workshop alterations of components of an assembly. mere change in size of article. flags, emblems or signs of any country. layout designs of integrated circuits. A representation sheet of an article is an important document required to be filed alongwith the application for registration. The representation sheet of an article needs to be prepared diligently and shall be filed along with the application. The Designs Rules require that four copies of the representation shall be filed along with the application. However, as the records are digitised and processed electronically, two copies of the representation will suffice. Representation means the exact representation of the article for which registration is sought. A representation may contain more than one page. Representation shall be exactly similar drawings, photographs, and tracings including computer graphics or specimens of the design. The Controller may require a specimen of the article to be submitted at the time of examination, in rare cases. Photographs should be pasted on the representation sheets with the help of adhesive and not by other means like stapler, pin and cello tape. 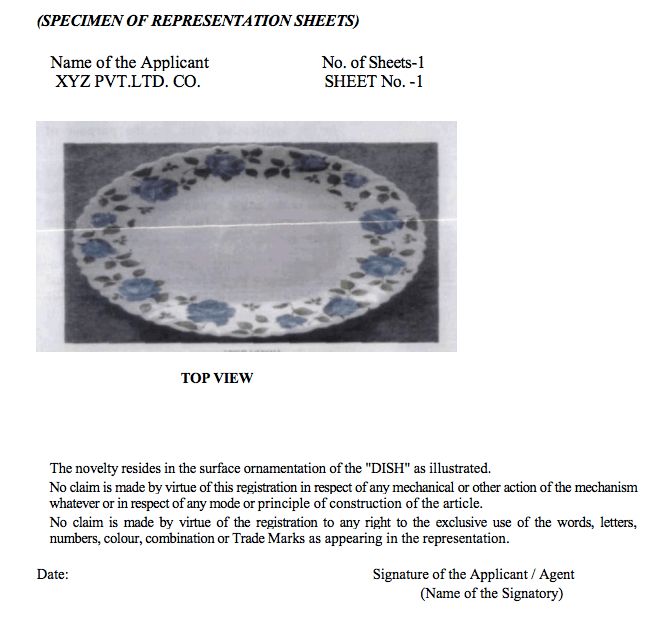 While using photographs in representation sheets, one of the copies of representation sheet shall not be covered by cellophane or tracing paper so as to enable digitisation. Representation shall be prepared on white A4 size paper (210 mm X 296.9 mm) of durable quality, but not on card board, and only on one side of the paper. The figure(s) shall be placed in an upright position on the sheet. Each figure shall be designated clearly (e.g. perspective view, front view, side view). If design is to be applied to a set, the representation shall depict various arrangements in which the design is to be applied to articles in the set. Where an application is for a design as applied to a set, whether the given articles constitute a set or not, shall be determined by the Controller. In case, name or representation of living persons appear on a design, consent of such persons may be submitted along with the application. In case of a deceased person, the consent of legal representative may be submitted. It may be noted that non submission of such consent may result in office objections and resultant delay in registration. In case, the representation contains the image or name of an imaginary person, such fact may be mentioned in the declaration on the representation sheet. A statement of novelty and disclaimer (if any) in respect of mechanical action, trademark, word, letter, numerals should be endorsed on each representation sheet. Representation, which consists of a repeating surface pattern, shall show the complete pattern, and a sufficient portion of the repeating pattern in length and width, and shall not be less than 15.00 centimeters by 10.00 centimeters in size. The name of applicant shall be mentioned in left hand top corner of the representation sheet. Total number of sheets and sheet number shall be mentioned in the right hand top corner of the representation sheet in Arabic numerals. . The representation sheet shall be signed and dated by the applicant/agent. No descriptive matter or matter denoting the components by reference letters/numerals shall be included. No sectional views shall be incorporated in the representation sheet. Dimensions or engineering symbols etc. shall not be used in the representation sheet. The representation is not to be regarded as engineering drawing of the article. The relevant parameter is the shape and not the size of the article. Where Trade Marks, words, letters or numerals are not the essence of the design, they shall be removed from the representations or specimens. Where they are essence of the design, a disclaimer shall be given in the representation sheet disclaiming any right to their exclusive use. No extraneous matter or background shall appear in the representation sheet. A background is considered neutral as long as the design is clearly visible in it. When colour combination is the essence of a design as applied to an article, the same shall be clearly depicted in the representation. Our Professionals are possess deep exposure in Industrial Design registration, Representation in Personal hearing and Legal proceedings like filing appeal to High court experience can remarkably add value to patent application. FinTaxx Patent Professional is the right choice to get your Design registration success. Is FinTaxx Industrial Design Professional works in all State for Patent Registration? Yes. We do serve our clients PAN India from our Branch Offices and Associate Patent Professionals in Major Cities. What is meant by ‘Design’ under the Designs Act, 2000? Can stamps. Labels, tokens, cards be considered an article for the purpose of registration of Design? What is the Validity of the registration of a design? Can it be extended? For ascertaining whether registration subsists in respect of a design, a request should be made to the Patent Office. If the Design number is known, the request should be made on Form 6, otherwise on Form 7, together with prescribed fees. Each such request should be confined to information in respect of a single design. Piracy of a design means the application of a design or its imitation to any article belonging to class of articles in which the design has been registered for the purpose of sale or importation of such articles without the written consent of the registered proprietor. Publishing such articles or exposing terms for sale with knowledge of the unauthorised application of the design to them also involves piracy of the design. Can the Registration of a Design be cancelled? How? >It is not a design under Clause (d) of Section 2. Is it mandatory to make the article by industrial process or means before making an application for registration of design? Why is it important for filing the application for registration of design at the earliest possible? Yes, it is possible to transfer the right through assignment, agreement, transmission with terms and condition in writing or by operation of law. However, certain restrictive conditions not being the subject matter of protection relating to registration of design should not be included in the terms and condition of the contract/agreement etc. An application in form-10, with prescribed fees in respect of one design and appropriate fees for each additional design, for registration of the transfer documents is required to be made by the beneficiary to the Controller within six months from the date of execution of the instruments or within further period not exceeding six months in aggregate. An original/notarised copy of the instrument to be registered is required to be enclosed with the application. How it is possible to restore the lapsed design due to non-payment of extension fee within prescribed time? > Application for restoration in Form-4 with prescribed fees is filed within one year from the date of lapse stating the ground for such non-payment of extension fee with sufficient reasons. > If the application for restoration is allowed the proprietor is required to pay the prescribed extension fee and requisite additional fee and finally the lapsed registration is restored. The Patent Office does not become involved with any issue relating to enforcement of right accrued by registration. Similarly The Patent Office does not involve itself with any issue relating to exploitation or commercialisation of the registered design. > Ordinarily on sale or intended to be used together. > All having common design even though articles are different (same class). What is an artistic work which is not subject matter of registration? > A painting, a sculpture, a drawing (including a diagram, map, chart or plan) on engraving or a photograph, whether or not such work possesses artistic quality. > Any other work of artistic craftsmanship.